Although there are a number of cognitive processing deficits that can cause a diagnosis of dyslexia or a reading disability, challenges with auditory processing tend to be the prevailing cause for many struggling readers. However, many of the terms used to describe these core problems can be confusing. In fact, wading through a comprehensive testing report can be overwhelming, because they are packed with complex cognitive and remedial terminology. In this blog, I hope to unscramble the tangle of terms associated with auditory processing. What are Some Key Terms One Should Understand? Auditory Processing: Auditory processing is the brain’s interpretation of the sounds we hear. A difficulty or delay with auditory processing is not an issue with hearing, but with the understanding of what is heard. It’s a complex operation that involves auditory synthesis, auditory closure, auditory sequencing, auditory discrimination, segmenting and auditory memory. Auditory Synthesis or Auditory Blending: The ability to pull together individual sounds to form words. Auditory Closure: The ability to fill in any missing sounds to decode a word. For example, this may involve understanding what someone with a foreign accent maybe saying when they delete a sound or two in a word. Auditory Discrimination: The ability to recognize differences between sounds. For example, some students may struggle hearing the difference between the short “e” and “a” sounds. Segmenting: The ability to break a word into individual sounds or phonemes. Auditory Memory: The ability to remember what is heard. to detect and discriminate a broad awareness of sounds including rhyming words, alliterations, syllables, blending sounds into words, as well as deleting or substituting sounds. Phonemes: The tiny units of sound that make up speech – such as the letter sounds. 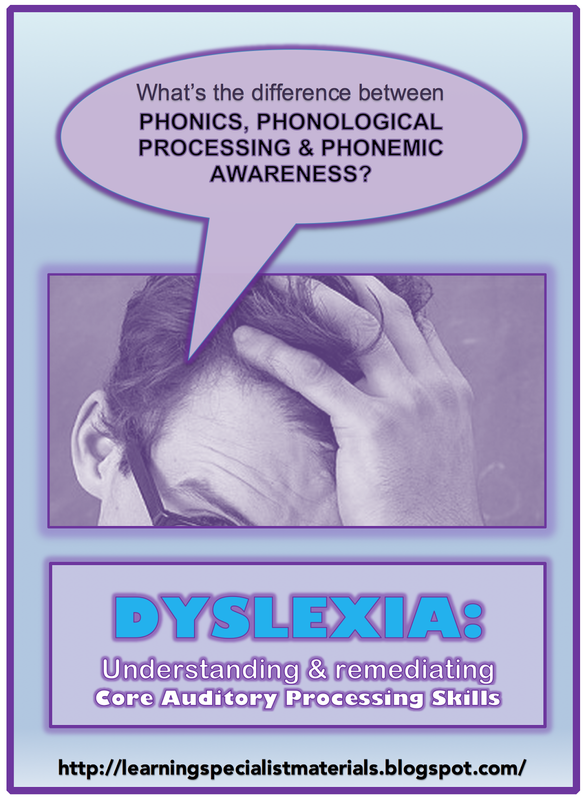 Phonemic Awareness: The ability to hear, identify, and manipulate individual sounds – also known as phonemes. This, for example, includes the ability to detect the first sound, middle sound and end sound in a word. Phonics: A method of teaching reading by pairing sounds with letters or groups of letters. It is the process of mapping speech into print. How Can These Difficulties be Remediated? Use an Orton-Gillingham, phonics based reading program that offers activities that strengthen auditory processing. One of my favorite programs is Nessy Reading and Spelling. There are many programs available, and our friends at the Dyslexia Reading Well offer a great review of the different programs. Build core cognitive skills through games and remedial activities. Here is a great bundle of cognitive exercises at Good Sensory Learning. Integrate fun activities that help students to practice the needed skills. Check out the Reading Games, following Directions Activities and other fun reading publications at Good Sensory Learning. I hope you found this helpful. I would love to hear your thoughts.